The muscles that bend or flex the fingers are called flexor muscles. 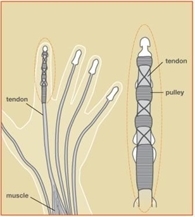 These flexor muscles move the fingers through cord-like extensions called tendons, which connect the muscles to bone. The flexor muscles start from the elbow and forearm regions, turn into tendons just past the middle of the forearm, and attach into the bones of the fingers (see Figure 1). 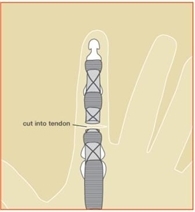 In the finger, the tendons pass through fibrous rings called pulleys, which guide the tendons and keep them close to the bones, enabling the tendons to move the joints much more effectively. 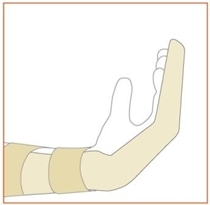 The information on this webpage is based on material from the American Society for Surgery of the Hand and is for educational purposes only.